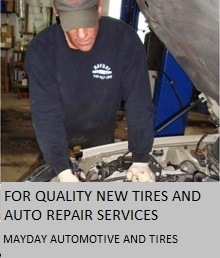 Mayday Automotive and Tires of Johnstown, OH has been your trusted quality new tires and fast and efficient auto repair services provider for over 22 years. We guarantee you only good quality service and we also do custom exhaust repairs. We are a proud member of BBB. We accept major credit cards.